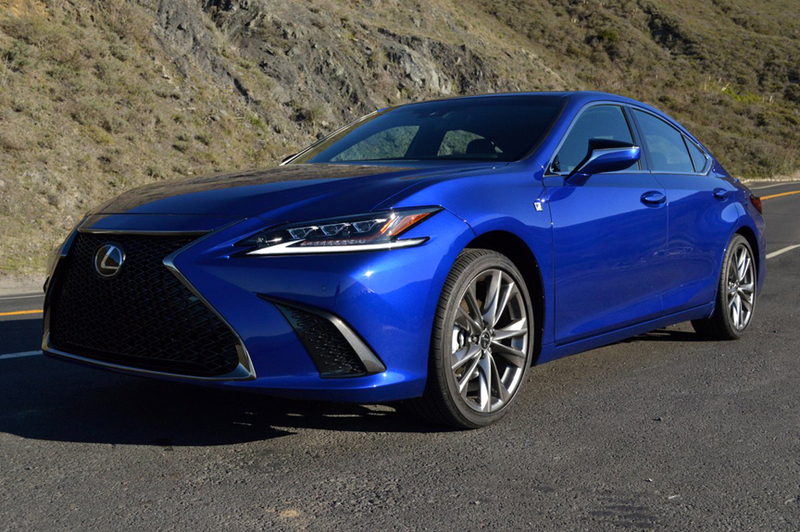 As the ES model line begins its third decade of production, it is fitting that this most popular Lexus family sedan has really made a clean break with the past. 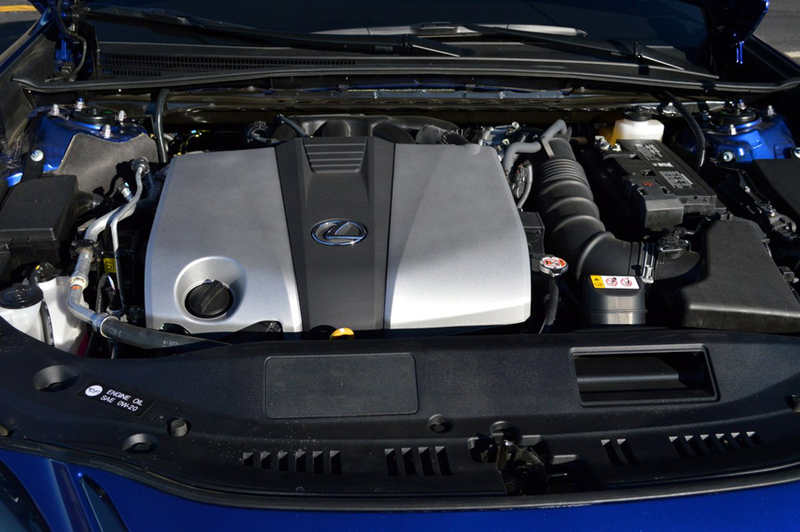 The ES350 we recently drove boasted not only a new front-wheel-drive chassis platform (designated GA-K), but also a more powerful 302hp 2GR-FKS V6 engine driving through an all new 8-speed automatic gearbox. If all that technological infusion isn't enough to stir your blood, try this on for size: our test car was equipped with the first ever F Sport package to grace an ES350. 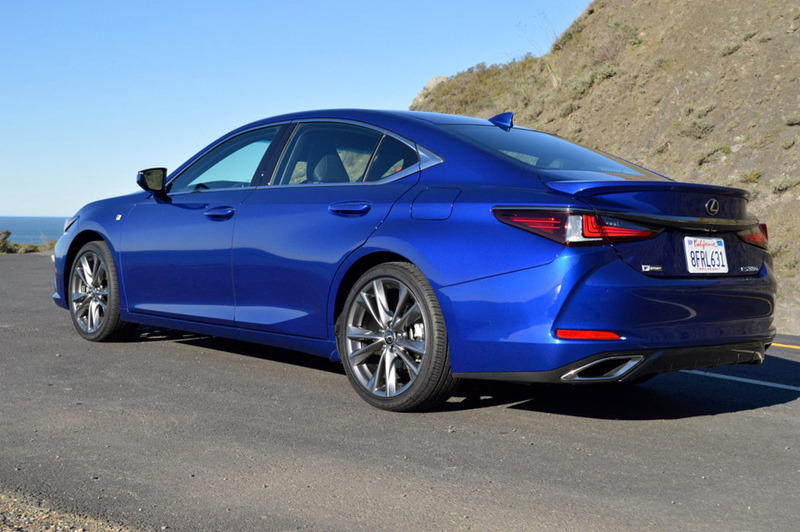 All in all, Lexus has managed to transform their previously plush but stodgy Toyota Camry upgrade into a full-fledged Lexus performance sedan fully worthy of the F Sport appellation. This vehicle's base price of $44,035 includes almost all the F Sport niceties: 10-way bolstered front seats that are heated and ventilated; Drive Mode Select (for Eco, Normal, Sport and Sport+ operation); F Sport Suspension Tuning; Performance Dampers front and rear; 19 inch split-spoke alloy rims mounting Bridgestone Turanza EL 440 rubber (235/40R19, TW $80); "Hadori" aluminum interior trim and pedal facings; F Sport Exterior Styling Cues including Rear Spoiler, Unique Front Bumper, Blacked Out Grill and Special Rear Valance. The only F Sport item which tallied a separate charge was the optional $180 heated leather steering wheel, which offered two temperature ranges. The heater did not need to be reactivated upon restart, and proved invaluable on a series of 39 degree morning drives. By the time we factored in $750 for Adaptive Variable Suspension, $1,065 for Blind Spot Monitor, Rear Cross Traffic Alert and Intuitive Parking with Auto Stop Assist, $1,515 for Triple Beam LED Headlights, $3,000 for Mark Levinson Audio Package and Navigation System, and $595 for Premium Paint (Ultrasonic Blue Mica), the bottom line of the ES totaled $52,790 including delivery. In the bigger picture of Lexus Land, however, this ES F Sport - even at its fully optioned price - represents the best bargain in the Lexus line. For comparison sake, just check what $52,000 will get you in a 4-door from Mercedes, Audi or BMW. Not much, compared to the F Sport Lexus ES. Despite its ample size and girth, the sport tuned ES proved surprisingly agile and quick. Bearing in mind that it weighs 3,845lbs and stretches 192in. long, the ES drove lighter and shorter than it is. Part of the fun here involved manipulating the Drive Mode Selector, which is niftily perched on a stalk protruding from the right side of the instrument binnacle. As soon as you dial up "Sport+" the instrument faces mutate from a common white on black format to full-race graphics, with bright white dial faces highlighted by day-glow pointers and redlines. The visual transformation puts a zip in your throttle foot before you even engage Drive. Not only does the suspension morph from flaccid to taut, but the steering feedback sharpens as well. Lexus has even insinuated a throaty V6 soundtrack into the cockpit, which plays its aria through that Mark Levinson system's 17 speakers and 1800 watts of output. As you sail effortlessly past slower traffic, you wonder "Am I really driving an ES 350 Lexus" because this one performs like no ES that has gone before it. Thanks to its over-square bore and stroke dimension (94mm bore x 83mm stroke) the 2GR-FKS power plant loves to spin toward that dayglow illuminated 7000rpm redline. The 8-speed gearbox, which replaces the outdated 6-speed of previous ES models, is fully complicit in your driving joy since it's equipped with paddles at the wheel, and a manual shift gate that puts you squarely in control of all gear operations. But bear in mind that if you dial the F Sport Mode Selector back to "Normal" you will enjoy the unalloyed ride comfort ES vehicles have been providing since 1989. The interior of this sedan is spacious, plush and well engineered. there's a 12.3 inch color multimedia display screen operated by a mouse pad between the seats. While this method of operation leaves something to be desired in terms of its over-sensitivity to touch, it is far superior to most such interfaces. However, the absurd number of menus and sub-menus has gotten completely out of control. This Lexus marks the first time I was unable to deactivate the annoying seat/steering wheel valet despite 15 minutes of menu perusal. 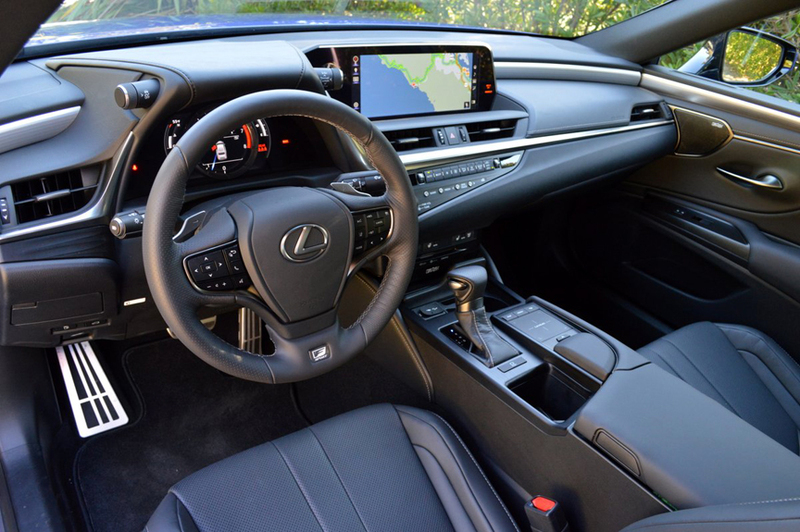 Despite these minor annoyances, millennial buyers will undoubtedly celebrate the fact that Lexus has finally integrated all the following systems: Siri Eyes Free, Google Voice Control, Lexus Enform Remote with Smart Watch and Alexa Skill Integration, Amazon Alexa Compatibility, Scout GPS, and Link TurnStream and MapStream Compatibility. Finally, the new ES is the first Lexus to offer Apple Car Play (no Android Auto, though). I suppose with all that automation, I am lucky the ES still allowed me to drive it using just two hands, two feet, two eyes and two ears.